Key takeaway from the 'Three Amigos' summit. Many U.S. voters have shown this year that they're skittish on foreign trade, but two close U.S. allies are moving in the opposite direction. Canada is strengthening direct economic and political ties with Mexico, the two NAFTA members firming up their relationship asDonald Trump blasts the North American Free Trade Agreement, and Bernie Sandersand others condemn the proposed Trans-Pacific Partnership (TPP). "That is going to do a lot to restore relations. 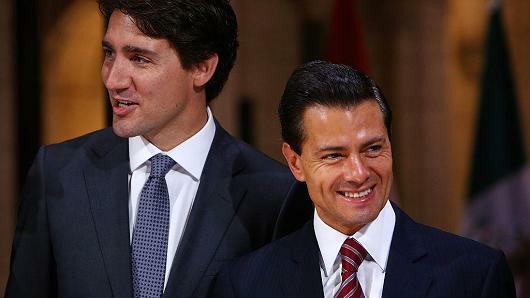 I don't think (Mexico) President Pena Nieto would have visited Canada in that last leader summit had they not done so," Laura Dawson, director of the Canada Institute at the Woodrow Wilson Center, told CNBC. "At the same, the U.S. continues to have a visa for Mexicans coming to the United States; it is not the fact of the visa, it's how intrusive the Canadian visa was." The visa restrictions are expected to be lifted by December of this year. The U.S. has traditionally had stronger economic ties with both Canada and Mexico than either has had with the other. Mexican imports into Canada dropped to about $14 billion in 2009, after the imposition of the visa. That is the lowest it's been at between 2005 and 2015, and imports and exports have since been rising slowly. Mutual investment will be a focus for Canada and Mexico going forward, said professor Laura Macdonald of Carleton University in Ottawa, Ontario. The most recent major business deal between the two countries was when Grupo Bimbo, a large Mexican baking company, purchased Canada Bread in early 2014. "Under this new relationship with Canada and Mexico, we're likely to see more Mexican investment in Canada and vice versa, so I think it's a very promising move," Macdonald said. When President Barack Obama, Canada's Trudeau and Mexico's Enrique Pena Nieto met in Ottawa in June for the North American leader's summit, they announced an agreement to use clean energy to generate half of North America's electricity by 2025. However, with the looming possibility of aDonald Trump presidency in the United States, future United States-Mexico economic ties are less certain. That situation has prompted more talk of direct trade between Canada and Mexico, both of which are also signatories to the TPP. "With the uncertainty surrounding the NAFTA and even the TPP, Canada and Latin America really need to reach out to each other more directly and if necessary bypass the United States, and build up their own direct economic ties," Dawson said. She said she sees the U.S. turning a corner in terms of its approach to foreign trade. Canada "used to count on the U.S. for opening up new markets; I'm not sure that that leadership is going to be re-established anytime soon," she said.